I am utterly delighted. For the first time, I feel like I'm really doing something right. The pediatrician told us (basically) that all of the preemie concerns were well behind us, and that we have a robust and thriving daughter. I can't even begin to describe the relief I feel. Andrew and I were high five-ing each other all the way home after her appointment. Success as a parent is - apparently - measured in inches and pounds. And her smile to top it off. And now I'm smiling too, just looking at her picture. Jasmin, I know exactly how you feel. Even now that my first child is 19 years old, I remember vividly how slowly she gained weight as a baby and how inadequate I felt (how could I be such a confident knitter and have no confidence as a new mom?!) I too felt overjoyed when the needle started to move and things started to click with nursing, etc. With the preemie concerns and nursing struggles, this is certainly a win. Now look forward to other wins when you are confident in you (both) as parents who make decisions that are best for your child even if they are against friends, family, schools, and even doctors. 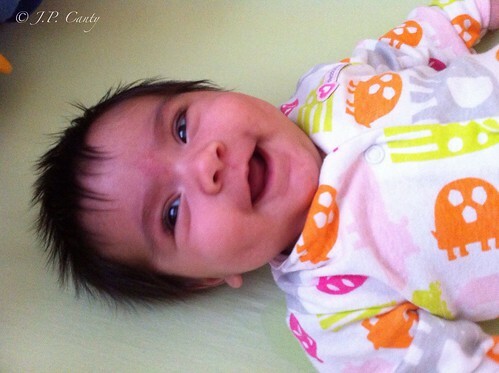 Beautiful, happy baby! Yay! I can so relate. I was looking at the baby scale in the ped's office the other day and remembering weighing my now 5yo on that very scale, fingers crossed that she was gaining. Congrats on the parenting win!! Virtual high five to you from me! Great picture. Truly made my day. See we told you were a good mom. Judging by that smile, I'm sure you don't have anything to worry about. She looks so much like her grandma! Just adorable!!! Congratulations. Those smiles are the best reward for all the hard work. She's beautiful, Mama!! Good job. Of course there was never any doubt about it. Love that beautiful smile. What a happy beautiful baby! That picture is fantastic! Never doubt that you guys are doing all the right things with her. Just watching you with her shows you're a natural. Congratulations! I can totally relate to how proud you feel; I felt the same at the 1-month visit when it transpired that my daughter was gaining 35g/day (1.25 oz) on average. Though with Genevieve starting off as a preemie you guys can be extra proud. These big smiles do make up for all the hard work, don't they! Genevieve is evidently thriving - and she's adorable.